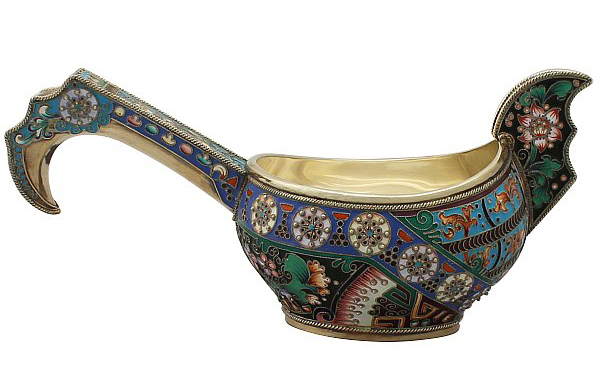 The kovsh is a Russian ladle or drinking vessel that dates back thousands of years to the tenth century. In this era they were simple wooden products used to drink braga (a light beer), kvass (a brew fermented from black bread), and mead (a slightly alcoholic drink derived from honey). Often the shape of the kovsh was similar to that of a ship, goose, or a duck; the body was used as the container for the liquid and the head and the beak (or the bow and the stern) were used as the handles. The avian shape of the kovsh emphasises the Russian affinity with nature. In Russian culture around this time ducks were seen as a link among the earthly, heavenly, and underground realms, since they live on the earth, fly in the sky, and swim in the water (which they believed led to the underworld). It was around the middle of the fourteenth century when the first metal models of the kovsh appeared. In this period, the name kovsh was created for the vessel. Due to the variation in sizes, origin and uses, it is perhaps best to refer to the vessel as kovshi. Over the centuries there have even been different terms invented to refer to the diverse kovshi. 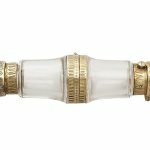 The larger kovshi, referred to as vynosny, were shared between dining companions, the smaller ones known as piti, were given to each guest as real glasses. 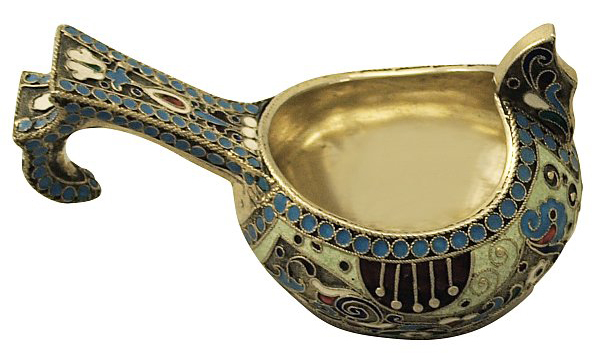 The smaller, individual-sized kovshi were sometimes utilised as a ladle, used to pour out the drink from a larger kovsh. For presentation purposes, the smaller kovshi used as ladles were often hooked on the side of the larger kovshi. Perhaps the most famous form of kovshi is the zhalovannye. This form of kovshi was popular around the eigthteenth century. The zhalovannye almost entirely lost their function as vessels and started to become made for decorative purposes. 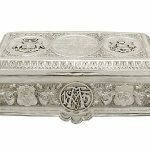 They were frequently awarded as gifts from the Tsars to loyal supporters of the empire, often the zhalovannye would have been engraved with the recipients name on the side. An example of the gifting of a kovshi is Tsar Peter I the Great presenting to Frederick Augustus I of Saxony a beautiful kovshi made of gold and Niello, wonderfully decorated with pearls and sapphires. 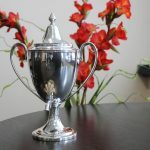 Although the kovsh suffered from a slight decline in the mid nineteenth century, there was a resurgence of the kovsh in the late nineteenth century as purely an ornamental object. 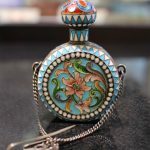 Some of the famous Russian silver craftsmen including Ovchinnikov, Khlebnikov, Maria Semenova and also Fabergé created colourful examples of the kovshi, mostly decorated with cloisonné technique and further ornamented with precious stones, with the most varied shapes: viking boats, horses, birds. Today the kovsh can be what you make of it, whether that is as a vessel for drinking or a table ornament. Either way, anyone that looks upon a kovsh cannot deny its beauty! All finished in closhoney work. What is it’s value please. Next Entry: What is a Butter Dish?